The fascia and soffit system on a house, often referred to as the roofline, is the finishing/capping on the end of the roof structure where the rafters meet the external wall. It functions similarly to the skirting at the base of a wall or an architrave on a door frame - without it, the edge would be rugged and exposed and the underneath structures open to erosion and decay over time. 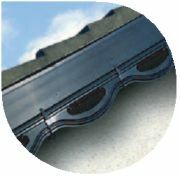 It provides both a decorative and protective finish to the roof while allowing industry specified levels of ventilation back into the roof area to avoid condensation problems. Freefoam’s products are designed to protect, to decorate, to ventilate, to insulate...in short, to perform. Freefoam offer a wide range of fascia/reveal liners and full replacement/new build fascias in a choice of styles,sizes and colours to suit any building design and improve the appearance of any facade. Whether for new-build or renovation, homeowners/installers We have a choice of plain, ogee, square edged, or round nosed fascia boards in 8mm and 10mm widths for capping or supported installations, as well as larger 15mm, 18mm and 25mm full replacement/new-build boards for the perfect installation each time. 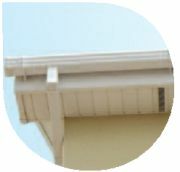 All fascia systems come complete with matching corners, joiners and end caps, and a selection of roofline accessories to a dd that finishing touch to any property. In addition to the 3 popular decor mouldings [ogee, plain open and plain closed], we now offer 2 new scalloped decorative fascias in convex and concave styles for quick, easy and stylish application. Some profiles can also be used as window boards and can be installed internally or externally as new/replacement window capping or as reveal liners.